Human beings have on the order of 100,000 different genes encoding the molecules needed to build and operate the human body; defects in any one of them can lead to disastrous consequences. There are an estimated 4,000 genetic diseases, which can be every bit as devastating as the diseases caused by bacteria or viruses, and in one way they are much worse: we pass them on to our children, generation after generation after generation. The New Healers is the story of the devastation these diseases cause, and the scientific researchers and doctors who struggle to combat them. Science and medicine have provided us with clues to the treatment of a few genetic diseases, although by their very nature they have never been considered curable. But, as William R. Clark shows, that is about to change through one of the most profound revolutions in modern medicine: gene therapy, a branch of the new field of molecular medicine. Clark takes us to the laboratories which have been able to isolate human genes, to make billions of copies of them, and to reintroduce healthy genes into unfortunate individuals who have inherited damaged or functionless genes. He also shows us how this same technology, turned around on itself, can also be used to deliberately introduce "bad" genes to attack and destroy unwanted cells, such as cancer cells or those infected with the AIDS virus. Molecular medicine will be a major part of our lives in the new millennium. 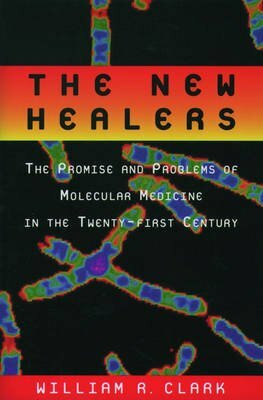 The New Healers outlines the powerful and compelling logic behind molecular medicine: that everything we know about molecular biology tells us that it can work, and that it will work. Clark introduces us to the scientists working now to map out the entire human genome, easily the medical equivalent of going to the moon, taking human beings to a completely new level of understanding of our biological selves. Clark also helps us to begin thinking about how we will manage that understanding, and how we will use the information we gain. The New Healers is a clear and compelling introduction to this important new frontier of human medicine, outlining for readers all the basic elements of molecular biology necessary to understand molecular medicine, and illustrating the fascinating stories of those doctors and patients already a part of this exciting future -- a future as full of promise as anything we have witnessed in this past century of remarkable progress.